For the few of you out there on TFO that have tried the game, I'd love your feedback. We're getting closer and closer to having a finished product. Once during each of your turns you may discard 2 cards to search your Stamina Deck for a non-unique Submission maneuver and put it into your hand. Your Submissions are +2 Toughness damage. During your turn, you may Exhaust this card to put one Submission from your corner into your hand. During Round 3, you cannot play Counters from your hand, and no maneuver can do more than 3 Toughness damage or 3 Stamina damage to you. All of your maneuvers in Round 3 are +3 Toughness damage. During your opponent's turn, you may Exhaust this card to counter any maneuver. Whenever you play a Counter card from your hand, shuffle up to one card from your Corner into your Stamina deck. If a card or card effect would cause any player to discard any number of cards, they discard that many +1 instead. When the fight is Grounded, your Strikes are +2 Toughness Damage and +1 Stamina Damage. When revealed, you may search your Stamina deck for one card titled "Hip Toss" and put it into your hand. During your turn, you may Exhaust this card, choose one card in your hand, and discard the rest. Your next Strike this turn is +4 Toughness Damage for each card discarded. 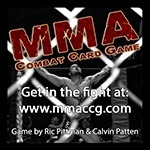 During your opponent's turn, you may Exhaust this card to counter a Takedown Maneuver. When the fight is Clinched, you may draw a card when your opponent counters a Strike. When the fight is Standing, you may draw a card when your opponent counters a Strike. After the first player's Draw step, you may put your hand on top of your Stamina Deck, search your deck for 4 different non-unique cards, put them into your hand, and shuffle your deck. If it is your turn, you may instead search for 5 cards. Before the first turn of the game, you may discard one card to draw three cards. Your opponent's Strike Maneuvers are -1 Toughness Damage and -1 Stamina Damage. When an opponent would cause you to discard any number of cards, you may put those cards on top of your Stamina deck instead. The Fight is now Five Rounds with additional Recovery steps after the Third and Fourth round. Your opponent's Submission Maneuvers are -1 Toughness Damage and -1 Stamina Damage. Once during each of your turns you may draw 1 card then put 1 card from your hand on the bottom of your Stamina Deck. Once during each of your turns you may discard 2 cards to search your Stamina Deck for a non-unique Strike maneuver and put it into your hand. Ignore the words "of 4 Toughness damage or less" on your cards titled "Well-Timed Counterpunch". During your opponent's turn, you may discard 5 cards to counter any maneuver and end your opponent's turn. During your turn, you may Exhaust this card. If you have fewer Routine cards revealed than your opponent, draw cards equal to two times the difference. You start the game with 25 toughness. Your toughness cannot go over 25. Card effects can't let your opponent look at your hand. If you discard a Counter card while Regrouping, you may draw three cards instead of two. At the beginning of your turn, you may look at the top card of your Stamina deck and put it on top or bottom of your deck. "?? Unnamed Card 1 ??" When your opponent Regroups, you may discard a card then draw a card. "?? Unnamed Card 2 ??" Your strikes and submissions of printed 2 Toughness damage or less can't be countered from your opponent's hand. "?? Unnamed Card 3 ??" When revealed, choose Strike, Clinch, Takedown, or Submission. Your maneuvers of the chosen type are +1 Toughness Damage and -1 Stamina Damage, your other maneuvers are -1 Toughness Damage.